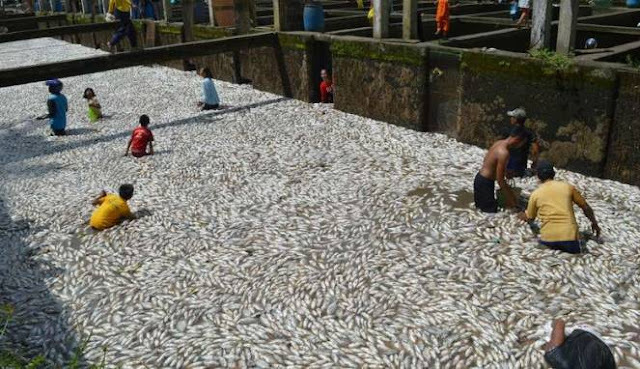 The Big Wobble: 100 TONS of fish (MORE THAN 2 BILLION) suddenly die in a fish farm in South Sumatra, Indonesia. 100 TONS of fish (MORE THAN 2 BILLION) suddenly die in a fish farm in South Sumatra, Indonesia. More than two billion fish, more than a hundred tons were found floating in a farm owned by Tegal Rejo Musirawas Regency South Sumatra, Tuesday, April 4, 2017. From the recognition of the guard pond, the number of dead fish reached 100 tons. Should those fish will be harvested, but unlucky all already dead. Losses were estimated at 2.1 billion. "That the contents of tilapia, tilapia and pomfret. Today should be the harvest," said Daryono. According to him, at 02.00 AM, embankment that supplies the water in the pond he guarded knew had broken. He tried to cover up. But in vain, the embankment of the elderly suffered a broken too wide. As a result, the water supply to swimming fast diminishing, and the fish was deprived of oxygen. "We had to close the breached levee made of wood, so the water remains in the pool. But it can not, because of the breakdown was great. About 7 meters," said Daryono. Meanwhile, Head of Fisheries Musi Rawas Bambang Hariyadi explained in the dike area there are 28 units belonging to the resident pool that already contains fish. "For the fish pond has been in operation since 2005. Alleged levee, because it no longer strong enough to accommodate the flow of water in the pond," he said. With these events, he will coordinate with the Department of Public Works to repair the dam. "It will be modified pattern with pool tarp system, in order to operate again," he said.